AFTER three years of being ever so close to a Grand Final appearance, it's a new era at South Fremantle in 2019 after a spate of retirees but coach Todd Curley doesn’t see any reason why they can't continue to perform strongly. Coming off a successful era between 2004-11 under coach John Dimmer where South Fremantle won two premiership and played in finals in each season bar one, it took some time to rebuild with four years out of finals. 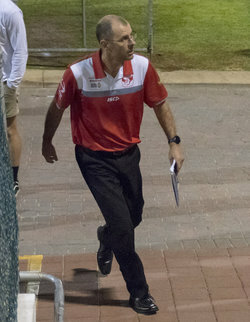 But by the time 2016 came around in Curley's second season as coach, it was a South Fremantle group ready to perform and over the past three seasons, they have finished second at the end of each home and away season while reaching the preliminary final on every occasion. The Bulldogs couldn’t quite advance to a Grand Final losing those preliminary finals to Peel Thunder, Subiaco and West Perth, and by the time they suffered their shock loss at Fremantle Community Bank Oval to the Falcons last year, it proved the end of an era in many ways. Ashton Hams, Ryan Cook, Ben Saunders, Shane Hockey, Cory Dell'Olio and Jarrod Parry all retired at the end of the 2018 season on the back of Blaine Johnson departing mid-season and then Matthew Parker getting drafted. That means that 820 games of WAFL experience departed with Hams and Dell'Olio their last two remaining premiership players while Cook is the club's longest-ever serving captain and Saunders has won three of the past seven Bernie Naylor Medals. "Obviously when you go through those names we've lost there is a different dynamic in our group and those players have had great careers, and had a great impact on our footy club," Curley said on 91.3 SportFM.